Are you happy when you can grow something that you don’t have to buy? Do you like nuts? Do you like a quick return on investments in your gardening and tree planting? Do you like versatile, tasty food with good nutrition? Do you like helping your animal friends, ecosystem? How about a cancer preventative food? 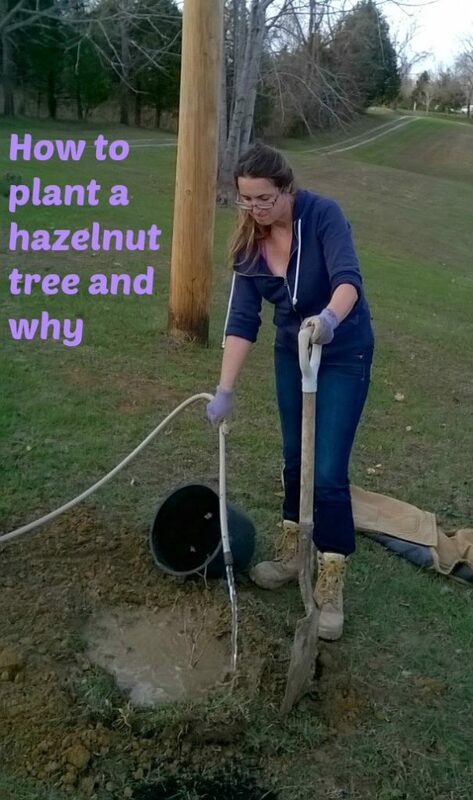 Here is how to plant a hazelnut tree and why it is a very practical, rewarding thing to do. Bears fruit(nuts) within 3-4 years- FAST! Growing hazelnuts is a fantastic opportunity. Hazelnuts are great for homestead self-sufficiency because you can grow and harvest nuts at home without having to plant trees that will grow huge, and take years before they produce. Hazelnuts or American filberts are native to the American Midwest, and grow in fertile, well drained soil. They also make an attractive hedgerow or individual planting that can produce heavily and consistently. Plant in late fall, when the tree is dormant, but it is not to cold for the roots to take hold of their new home. Choose your locations with the above items in mind (about 20 feet apart and full sun). Make sure your soil is well-drained. Dig the hole deep generously, making sure it is about twice as deep as the size of the root ball (the root ball is about the size of the container the plant is in). Keep the soil you remove digging easily accessible for refilling the hole. If you are in doubt about the soil being well drained, you can test it once you have the first hole dug. Fill it with water, if it drains within an hour, it is sufficiently well-drained soil. Refill the hole about 6 inches, loosening the clumps of soil as you push it back into the hole. You are making a soft, gentle “bed” to settle our sapling into. Remove your sapling from the container. You may want to use some clippers to cut it away from the plant, to avoid damage to the roots. 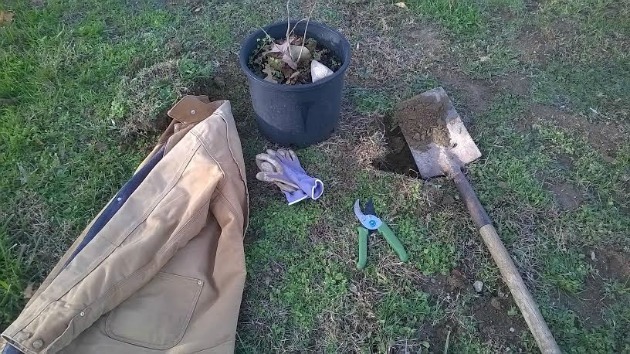 Or you can do what I did and water the sapling, softening the soil and slide the sapling gently out of the container into the hole. 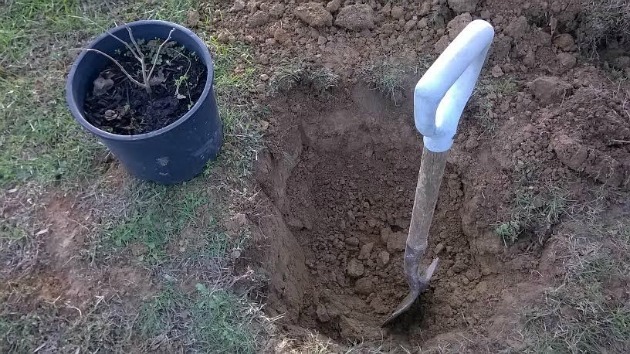 Then fill in the hole with the rest of the soil, loosening the soil clumps as you fill in the hole and bring the soil level up to the base of your tree. 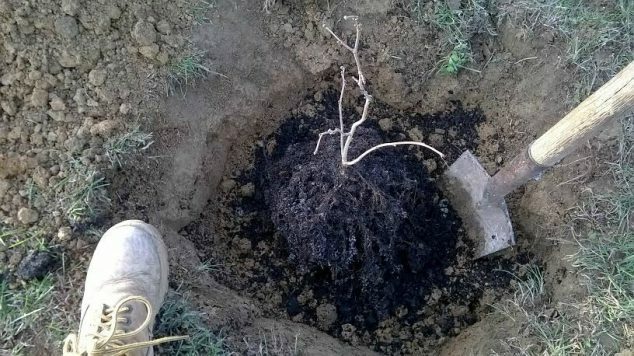 Water your newly planted tree with plenty of water, soaking it well enough to force out any air pockets. This is for the preservation of the roots. Hazelnuts are rich in unsaturated fats, the kind that are actually good for the heart. Much of this fat is oleic acid, shown to lower LDL “bad” cholesterol and raise the “good” HDL kind. Hazelnuts are rich in magnesium and it plays an important role in regulating the amount of calcium that goes into and out of the cells of the body. About two thirds of the magnesium the body uses goes towards building the structure and strength of the skeletal system. Hazelnuts are also rich in manganese, a mineral essential for the growth and strength of bones. Post-menopausal women are often deficient in manganese and can benefit from its ability to increase the density of bone, and fight osteoporosis. The nervous system needs amino acids in order to function, and amino acids require vitamin B6. Hazelnuts are rich in vitamin B6, allowing the nervous system to operate optimally. Hazelnuts are rich in manganese, which is an enzyme activator and a catalyst in the synthesis of fatty acids and cholesterol. It also promotes protein and carbohydrate metabolism. Hazelnuts are rich in vitamins B1 (thiamin), B2 (riboflavin), B3 (niacin), B5 (pantothenic acid), B6 and B9 (folic acid). Vitamin B aids in efficient protein, carbohydrate and fat metabolism. Plant a hazelnut tree, watch them grow, fruit, pollinate, attract wildlife, make a lovely hedgerow or border and finally bare nuts that you can harvest. If you are not yet a self-sufficiency nut, hazelnuts just may convert you! There are so many benefits to growing hazelnuts and hazelnuts have so many health benefits. Grow and enjoy! If you are interested in homesteading you may also enjoy these post on mayapples, herb window gardening, how to plant blueberry bushes, and raising chickens for eggs. I love hazelnuts. How I wish I had the space to plant a tree. I love this idea! I never would have thought about planting a hazelnut tree, but now I think you’ve planted a bug in me. I never realized you could plant a hazelnut tree, how cool is this? I must try to plant one next season if they will grow in my area that is. Honestly, I didn’t really even know how hazelnuts grew- I think it would be awesome to have such a hearty nut growing on the property. Thanks for the great tips and insight. Hazelnuts are some of my favorites! I never even thought of planting my own, silly me, I would love to have one. You are preaching to the choir here! I LOVE Hazelnut anything! If I lived where it would grow I would totally plant one. I had never thought of planting a hazelnut tree. Sign me up for planting several of them! I love, love, love hazelnuts. I love hazelnuts and had no idea how good they are for you. This sounds like a must do activity for my household for sure! I would’ve never thought to plant a Hazelnut Tree but what a great idea! We have a pretty decent size yard so this would be perfect! I never knew how many awesome benefits it had! I need to plant a Hazelnut Tree! I’m in zone 10b.. does anyone know the reason why they are only listed to zone 9? Can they not take the heat? Do they need a certain number of chill hours? I’d love love love to have one, but don’t want to spend money/time to only realize it won’t work here.